A business dissertation is a protracted document which identifies, scrutinises, interprets and delivers deductions and judgements on a particular subject. Professional copy editing services (copy-editing or copyediting) involves improving the readability of a document employing different tools and software. It involves checking the spelling and grammar of a document, making sure that the entire document is completely free from all types of mistakes and errors. The copy editing services begin by ensuring that all the sections are complete. For example, if there are 7 chapters listed in the table of contents. It will start by making sure that all the 7 chapters actually do exist in the exposition. When is Professional Copy Editing Required? If you want to check the content and structure of a piece of composition to verify that it is in fact valid. Are the title, headings and subheadings efficient or redundant? Are all the figures and illustrations easy to understand and fulfil the importance of being interesting and help to simplify the discussion? Are the footnotes and endnotes necessary and are they fulfilling their purpose? Copy editing is required to ensure that all the spacing and the page setup is effective to the style of presentation based on the subject of the composition. A copyeditor will remove any unnecessary formatting which obscures the main subject of the exposition. What are not Copy Editing Services? 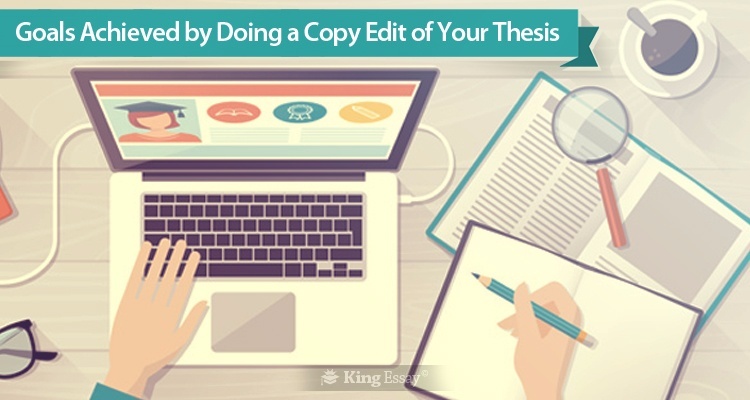 The difference between dissertation editing and copyediting is that at the time editing a dissertation it is possible that new research will be required. Copyediting will only make sure that the entire thesis has a logical structure, formatting and spelling. It will not add any new original contents to the work. Proofreading, checking for mistakes can be included. Submitting work which is not copyedited at an institute may result in not being able to get an effective evaluation of the production. The institute may decide to turn it down for evaluation because of the production’s inability to present a coherent and presentable final product. Even academic advisors will not take such work seriously for evaluation purposes. Researching for new illustrations to add will not be included. Copyeditors must have extensive knowledge in a number of fields for them to be successful. What to Expect in the Final Disquisition? When thinking about how to write a thesis, key copy editing terms should be the last thing on your mind. A completed work will contain zero plagiarism ensuring that all the references point to the correct entries in the bibliography. The reader will find no hindrance or obstruction in the contents to understanding the work. Any excess contents which make the entire work difficult to understand will be removed. All the punctuation throughout the whole composition will be fine tuned to meet subject requirements. The article will contain bias-free language. Copy editing will bring attention to any plagiarism or breach of contract, incitement or hatred, obscenity or any misrepresentation. Writers sometimes inadvertently end up misrepresenting theories and or concepts with the improper use of vocabulary. Copy editors will be able to bring this to their attention suggesting the correct usage where appropriate.